I love that overly ripe banana’s can be celebrated, because they are perfect for banana bread! I don’t generally LOVE banana bread unless it’s chalk full of textured goodness. I like nuts, but my kids don’t. 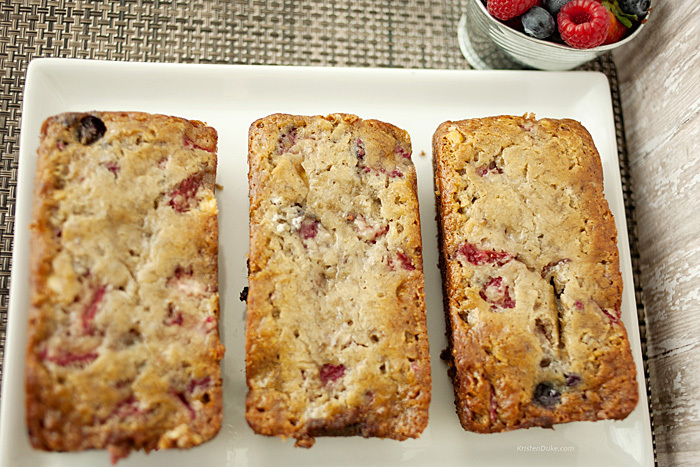 Since I’m pretty much obsessed with all things white chocolate, I thought I’d throw them into the banana bread mix, along with all of the delicious berries hanging out in my fridge. Thus was born the Triple Berry White Chocolate Chip Banana Bread in our home. You can certainly use frozen berries, but I used fresh. 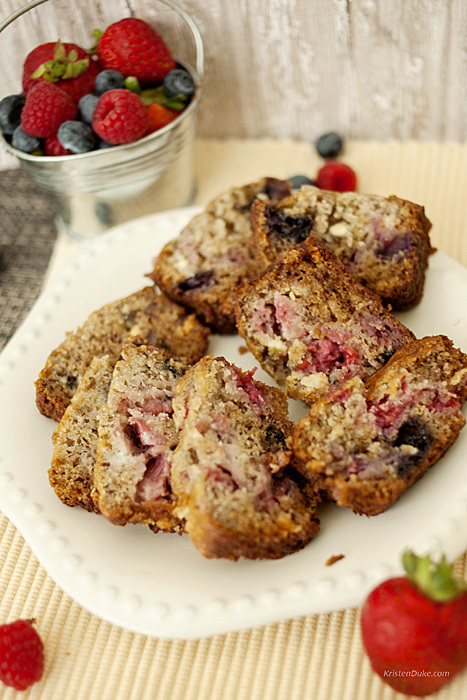 The juices in the berries make the banana bread SUPER moist, which is the only way I will eat banana bread! It’s often much too dry for me. I need to SEE the moisture! 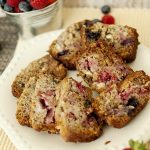 Fresh strawberries, blueberries, and raspberries make this banana bread delicious and moist, and the white chocolate chips give a yummy texture.
) Preheat the oven to 350 F.
) In a large bowl, mix mashed bananas and melted butter.
) Mix in the sugar, egg, and vanilla.
) Sprinkle the baking soda and salt over the mixture and mix in.
) Add chopped strawberries, raspberries, and whole blueberries to the batter and mix them in to distribute evenly through the batter.
) Spray a few loaf pans or muffin tins.
) Bake a large loaf pan for 1 hour or muffin tins for 25 minutes.
) I made 3 mini loaves and 18 muffins with this mixture. Half the recipe for less. When I bake, I like to makes lots so I can eat a generous portion, and then share with others. 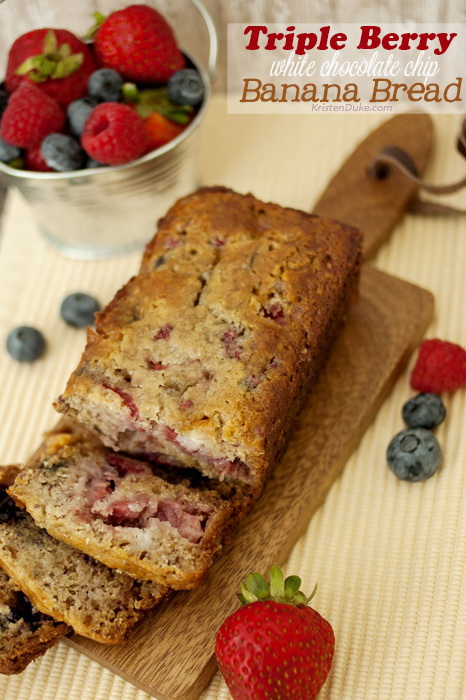 Let me say to my delight and chagrin…that I did eat a generous portion of this triple berry bread. I LOOOOOVED the berries oozing out into every moist bite. Berries are still in season for a little while longer, so whip yourself up a batch (or grab frozen all year long)! Do you love banana bread? What are your favorite mix ins? I’d never tried making it with berries before and I LOVED it so much, I think I’ll do it every time now!